So, I needed to be able to upload my zip file to Amazon S3 using the command line. But unfortunately the only S3 copy or backup tools I found for Windows was either graphical and user driven or required Java, Perl or such and I didn’t really feel like installing any of that stuff on my server just for this simple task. It’s a single exe file. No need to install anything, the dll is contained in the exe. Feel free to use it if you like! I’m running a few Google Adwords campaigns but I must admit I’m not doing it properly. I’m too lazy to do proper follow-ups, check what new keywords are hot etc. So being lazy I’ve been running the Budget Optimizer for a long time. The Budget Optimizer lets you set a monthly budget and is then supposed to use its intelligence to bid on keywords to maximize the number of clicks you get each month. Being even more lazy I switched to the Conversion Optimizer without following up how it was performing. This was about a year ago. Early this month I finally did the follow up – simply comparing the number of clicks, cost and conversions to before. The result – about 30-50% less clicks and conversions than before. Cost – the same. Confirming this I changed back to the Budget Optimizer on April 10. 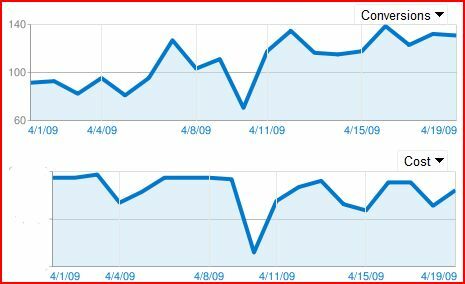 As you can see on the graph I had one day of “down time” and after that conversions and clicks raised at the same cost. I’m sure there are a lot of settings and tweaking you can do to improve the numbers I have been getting. But again I have been too lazy to find out. But then again Google market these tools – Budget Optimizer and Conversion Optimizer – as tools for people like me, who are too lazy to follow-up and do their own keyword bidding.